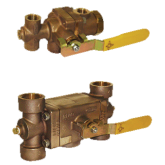 The DR Diverter Valve Series provides a simple solution for the isolation of pressure relief devices during routine change out of a relief valve without evacuating the vessel. Excellent for protecting bulk liquid vessels, transport trailers, industrial pipelines, and LNG systems. • High flow rates complement our AR series pressure relief valves. • Valve side selection is accomplished with a heavy duty control arm clearly labeled for positive isolation. • RegO® needle valves accessorize for easy bleed of gas before removing pressure relief devices. • Fitted with threaded top Relief Valve ports and bottom Burst Disk connections. • Temperature Rating: -320°F (-196°C) to +165°F (+74°C). 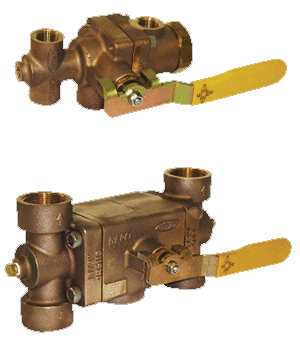 Diverter Valve - 1-1/2" x 1-1/2"
Diverter Valve - 1-1/2" x 1"
Diverter Valve - 1" x 3/4"